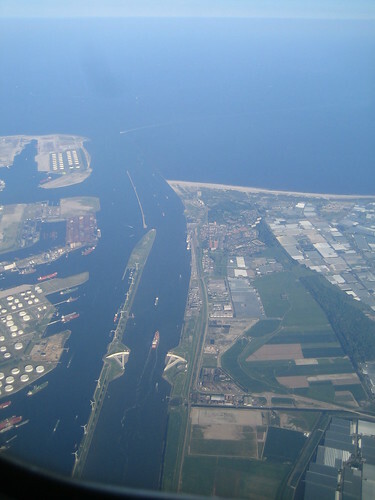 World's largest storm surge barrier, known as Maeslantkering, is located on the Nieuwe Waterweg (meaning - New Waterway) canal between the towns Hoek van Holland and Maassluis, Netherlands. Besides being the World's largest storm barrier it is also of one of largest moving structures on Earth. The barrier, built to protect the port of Rotterdam was commissioned in 1997. It consists of two large floating gates, 210 metres long and 22 metres high, each having 237 metres long steel truss swivel with ball-socket movement on both the banks of the waterway. The ball shaped joint, which is also the largest in the world has a diameter of 10 meter and weighs 680 tons. The gigantic gates, which are considered as one of the marvels of engineering, took 6 years to complete and cost 450 million euro. When fully open the barrier provides a 360 metres wide passage to the ships. On a storm surge warning of more than 3 meters, the barrier is closed automatically through fully computerised operations. The huge gates float on water and on closure are filled with water so that these sink to bottom to provide adequate safety against storm surges. After devastation caused by Katrina, a similar barrier is being considered to protect New Orleans from future storms. 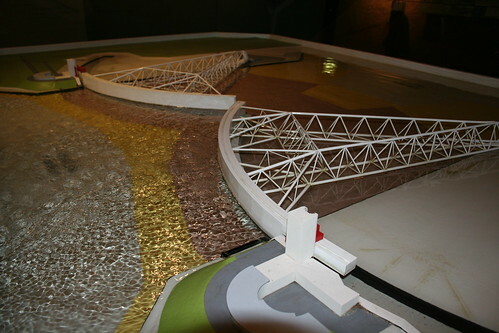 A 1:250 scale working version of the barrier at Madurodam miniature village. Another miniature model at the visitors centre near the Maeslantkering.